On the last day of our summer vacation, we packed up Klaus and started the drive home. We had promised Celeste that we'd stop at a Q'doba for lunch (her favorite place - the nearest one to us is by LAX), so we slogged through some morning rush traffic en-route. 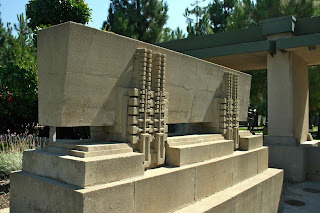 But since we would have ended up at Q'doba a bit early, we stopped at L.A.'s Frank Lloyd Wright-designed Hollyhock house to take in another one of the master's finest works and to kill a little time. 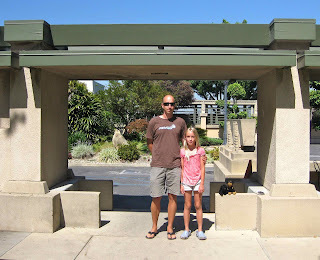 We're very fortunate that Celeste, like Allie and I, thoroughly enjoys architecture tours and loves modern structures. 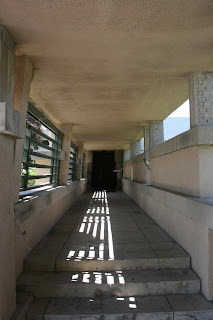 We toured FLLW's Taliesin West on the move out here and previously the three of us have visited the Robie House (Chicago) while Allie and I have toured his Oak Park, IL home and studio and Taliesin (Spring Green, WI). There weren't any tours scheduled that particular day, and our vacation budget was pretty much shot at that point, so we happily spent an hour or so exploring the grounds. 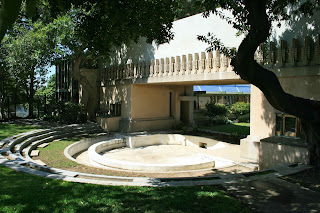 Built for oil heiress Aline Barnsdall between 1919-1921, the house is perched on a plateau just off of Hollywood Blvd. It's very pleasant up on the hill, most of the sights and sounds of the urban area disappear below you. 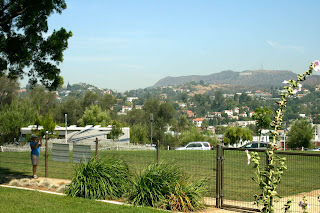 Off in the distance you can see the Hollywood hills. 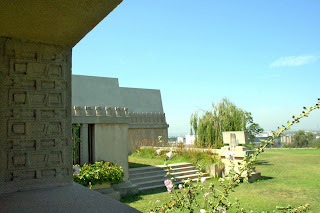 Always one to experiment with interesting new materials, FLLW made extensive use of cast concrete for the details of the house and surrounding grounds. 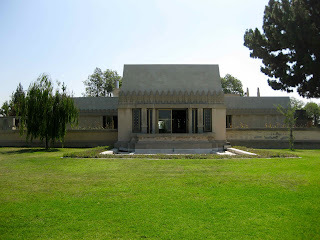 The central theme of the house is the hollyhock, Ms. Barnsdall's favorite flower. 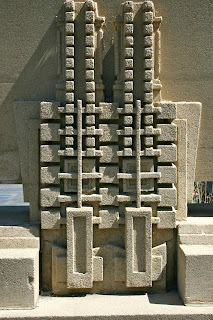 FLLW's stylistic hollyhocks are found throughout. Overall the home is one of "Maya revival" with the exterior walls tilted back at 85 degrees. It's quite an impressive structure (as they all are IMO). One of the most unique features is the reflecting pool which is not currently filled. 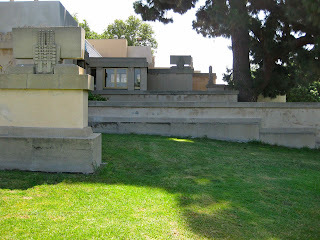 Like most Wright homes, the entrance is low, tight and somewhat hidden from view. Unfortunately the concrete construction has not held up all that well over the past 90+ years. Numerous earthquakes and weather have taken its toll on the structure. 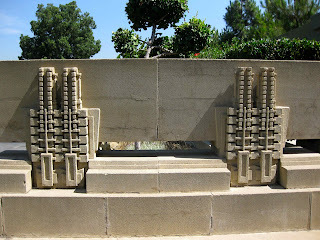 But it's owned by the city of Los Angeles and restoration is ongoing. I hope we can eventually tour the place - especially the interior and be able to have some insight into the design of this beautiful home. Oh, and as a footnote, Celeste was very happy to have her favorite "veggie burrito in a bowl" that day.